If you've been losing your hair when you have lupus, you may be wondering if this is normal. Why would this disease lead to hair loss? And, is there anything you can do? Lupus or "systemic lupus erythematosus" is a condition marked by a wide range of symptoms. While not as serious as some of the other symptoms of lupus, hair loss is no less annoying. Alopecia—the medical term for hair loss—affects roughly 45 percent of people with lupus at some time and to some degree. It is common enough to have been coined "lupus hair." Hair loss most often occurs early on with the disease, and It can even be the first sign that alerts people to its presence. With lupus, there are generally two forms of hair loss. One is related to discoid lupus and results in scarring. The other is non-scarring. Scarring alopecia most commonly results from lupus associated with skin diseases alone such as discoid lupus erythematosus or subacute cutaneous lupus rather than with systemic (all over) lupus. In these conditions, lupus interferes with the normal function of the hair follicle. With systemic lupus, hair loss can be either diffuse (all over) or localized. When it is localized it occurs most commonly on the front part of the scalp. Many short hairs at the front of the scalp have been coined "lupus hairs." Hair loss may occur only the scalp or may involve other regions of the body such as eyebrows, eyelashes, and body hair. Some people notice their hair thinning, while others note that their hair falls out in clumps or patches. Medications used to treat lupus such as prednisone and other immunosuppressives can also lead to hair loss. It’s not unusual to wash your hair and find a number of stray hairs in the bathtub. Sometimes, it may even seem like more than normal. But losing 50 to 100 hairs a day is perfectly common. Generally speaking, 90 percent of a person’s hair is growing at any given moment, with the remaining 10 percent in a “resting phase.” The growth phase (anagen phase) can last from two to six years, after which the hair follicle enters resting phase (telogen phase,) which lasts about three months. After the resting phase, hair is shed. A new hair grows where the last one shed, and the cycle begins anew. Heredity/genetics: Known medically as androgenetic alopecia, hereditary hair loss and thinning is the most common cause of hair loss. Typically, women will experience thinning hair while men will experience thinning hair, baldness or both. 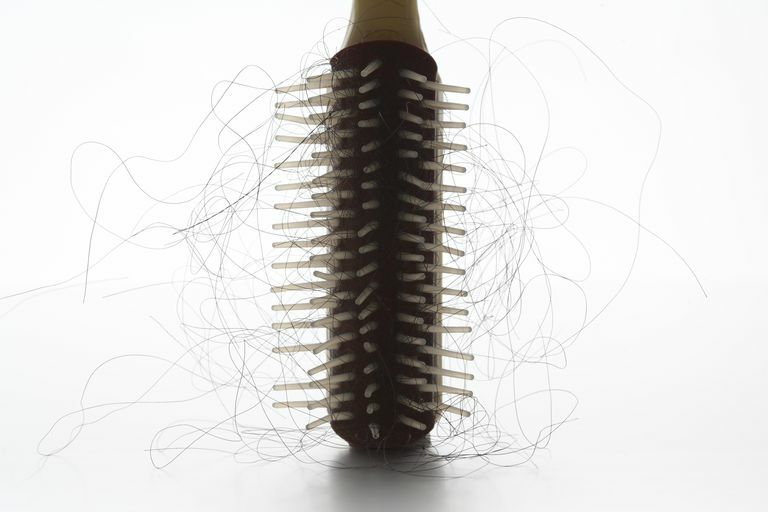 There is no cure for this form of hair loss, but medical treatments may help stem the onset. Alopecia areata: A bit of a mystery, alopecia areata is believed to be an autoimmune disease in which the body forms antibodies that attack its own hair. The disease causes hair loss marked by totally smooth, round patches about the size of a coin or larger. It may even result in complete loss of scalp and body hair, though this is rare. Chemical treatments: Hair dyes, tints, bleaches, straighteners, and other hair products with chemicals can cause weakness of the hair, making it brittle and causing it to break and fall out. If you encounter this form of alopecia, simply stop using chemical treatments until your hair has a chance to grow out. Tinea: Fungal infections can lead to hair loss. Traumatic alopecia: Continuously playing with hair can cause hair breakage. Thyroid conditions: Both hypo and hyperthyroidism can lead to hair loss. Nutritional deficiencies: Deficiencies in protein, iron, biotin, zinc are all associated with hair loss. With lupus, hair loss may be related to any of the causes of hair loss found in people without the disease, but can also be related to the disease itself or the treatments for the disease. As noted above, there are two different ways in which hair loss occurs with lupus. With systemic lupus, it's thought that hair loss is related to the autoimmune basis of the disease. With discoid lupus, permanent damage to the hair follicle resulting from scarring leads to hair loss. Making the correct diagnosis as to the causes of your hair loss is important. If your hair loss is related to a flare of your disease (telogen effluvium) it will regrow in time. Non-lupus causes, ranging from fungal infections to thyroid disorders need to rule out, rather than simply assuming the hair loss is due to your lupus. Your rheumatologist may recognize your symptoms and be able to diagnose you based on your history, physical exam, and laboratory tests alone. Sometimes a biopsy (skin biopsy of the scalp) will be needed to determine the exact reasons. Many people worry that their hair loss with lupus will be permanent, and it can be at times. Whether or not your hair will return depends on the cause of the loss, and as we've noted, there are several different reasons why this can occur. That said, much of the hair loss with lupus is reversible once treatment begins, or in the case of drug-induced hair loss, when the offending drug is discontinued. When hair loss occurs due to scarring involving the hair follicle (discoid lesions on the scalp), however, the loss may be permanent. Discoid lupus is a major cause of "scarring" alopecia. The best way to treat hair loss caused by lupus is to treat the underlying disease—your lupus. Getting good control over your disease usually results in good control of your hair loss as well. In addition, when your disease is controlled, some of the medications, for example, steroids, can be tapered or discontinued, resulting in an improvement in hair loss. People have tried a number of nutritional supplements, for example, biotin, but at this time there is not any strong evidence for these methods. Since dietary supplements may interfere with some medications, it is important to talk to your rheumatologist before taking any supplements. Coping with hair loss is frustrating. While many of the other symptoms of lupus are more concerning from a medical standpoint, hair loss is something that is seen each time you look in the mirror. It's important to talk to your rheumatologist about your hair loss. Your hair loss may be caused by a condition other than your lupus, or you may have a combination of hair loss from lupus and something else. Getting an accurate diagnosis is important. With reversible hair loss, the goal will be doing whatever is needed to help you cope with your hair loss until it grows back. Sometimes a good stylist can find you a style which minimizes the appearance of your hair loss, either covering bald spots and choosing a cut which makes your hair appear thicker. Hair extensions may help as well. With both temporary and permanent hair loss, options such as wigs, scarves, and hats can be helpful. There are many options available (thanks to the breast cancer movement) some of which are very attractive. People have wondered about the option of hair transplants. Unfortunately, the process that resulted in your hair loss in the first place may also reduce the chances for transplanted hair to become established. There has also been some concern that hair transplants could result in the reactivation of the disease. Talk to your dermatologist about the best options for you. Hoverson, K., Jarell, A., and W. Wohltmann. Lupus Erythematosis Tumidus of the Scalp Masquerading as Alopecia Areata. Cutis. 2017. 99(2): educationE22-E24. Kasper, Dennis L.., Anthony S. Fauci, and Stephen L.. Hauser. Harrison's Principles of Internal Medicine. New York: Mc GEducation, 2015. Print.